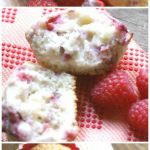 A not too sweet muffin with fresh raspberries is perfect for breakfast or an after school snack! Start out by preheating your oven to 400 degrees F.
Get out your muffin pan and line your muffin cups. This recipe makes approximately 18 regular sized muffins. In a large bowl, whisk together the flour, 1 cup sugar, baking powder, and salt. Next you will work in the softened butter with your electric mixer. The mixture will sort of resemble coarse sand. Now you will blend in the eggs, milk, and vanilla until all ingredients are combined, but being careful not to overbeat the mixture. Now you will gently fold in the raspberries. For the cream cheese component you need to mix together softened cream cheese and 2 1/2 tablespoons sugar in a small bowl until smooth and blended. Just keep this mixture off to the side for now. Take your muffin batter and scoop a generous tablespoon of batter into each muffin cup. You want there to be just enough that the bottom of each muffin liner is covered. Now add about a teaspoon of cream cheese mixture to the center of each muffin cup. Add another spoonful of batter on top of the cream cheese mixture in your muffin cup. If you want to dress your Raspberry Cream Cheese Muffins up a little you can sprinkle the top of each muffin with sparkling sugar. Bake the muffins for 20 to 25 minutes or until muffins test done with a toothpick. These muffins aren't overly sweet! The flavor of fresh raspberries shines through!